Rothkopf, Scott [supervised by Bernard Blistène]. Jeff Koons: La Retrospective. France: Centre Pompidou, 2014, p. 198 [not exhibited]. Koons, Jeff and Norman Rosenthal. Jeff Koons: Entretiens avec Norman Rosenthal. Hove, England: Thames & Hudson, 2014, pp. 60, 234-235 (in progress) [French Edition]. Koons, Jeff and Norman Rosenthal. Jeff Koons: Conversations with Norman Rosenthal. China: Thames & Hudson, 2014, pp. 60, 234-235 (in progress) [English Edition]. Koons, Jeff. Skin Fruit: Selections from the Dakis Joannou Collection. New York: New Museum, 2010, p. 11, illustrated in color. 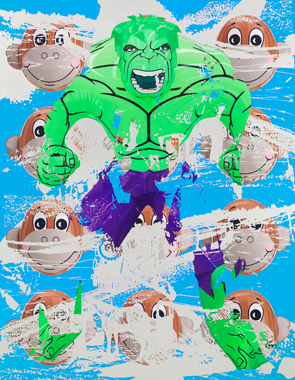 Jeff Koons: Hulk Elvis. New York: Gagosian Gallery, Rizzoli, 2009 [Text by Scott Rothkopf; interview with Koons by Hans Ulrich Obrist], pp. 71, 72-73 (detail), 107 (installation view), illustrated in color and illustrated in color on the cover. Holzwarth, Hans Werner, ed. Jeff Koons. Cologne, 2008, pp. 608-609, illustrated in color (in progress).